This year’s booklet arrived this morning. 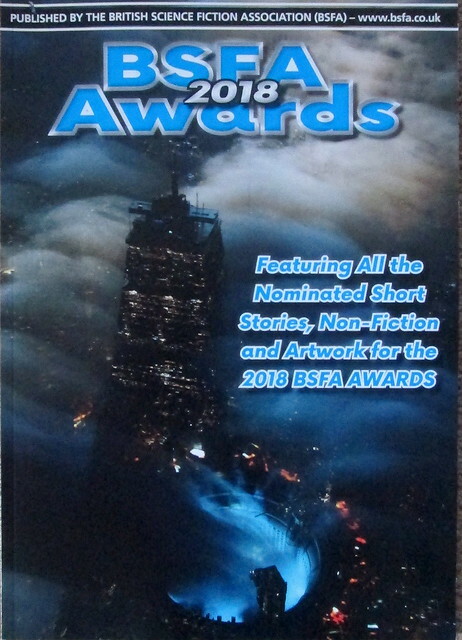 It contains all the short fiction and non-fiction nominees for the BSFA Awards for works published in 2018 and the artworks nominated for the relevant award. On perusing it I found the closing date for electronic voting is today so I had a lot of reading to pack in this afternoon. I have been expecting the booklet’s arrival since the turn of the month and was getting worried it would not be forthcoming in time. Eastercon, which I will not be attending this year, where the final awards will be announced, is of course this Sunday coming. The Enclave1 by Anne Charnock (NewCon Press, Feb 2017) is not obviously Science Fiction. Written well enough, it focuses on Caleb, a refugee seemingly from Spain but it could be further south, at a time when the world seems to have global warmed. It has some echoes of Oliver Twist as Caleb is variously exploited and learns to trust no-one. The titular enclave lies somewhere near Manchester. In These Constellations Will Be Yours by Elaine Cuyegkeng (Strange Horizons, 7/8/17) oraculos from the planet Buyin have enabled much swifter interstellar travel at the cost of having their backs opened, spines, brains and nervous systems attached to the galleon-ships which ply the celestial sea. Some avoid this fate by paying to opt out. There is a revolt. Uncanny Valley2 by Greg Egan (Tor.com, 9/8/17) is an extract only. The full text is available online but I dislike reading fiction from a screen so this one page sample had to do and was consequently hard to adjudge. Angular Size3 by Geoff Nelder ( SFerics, 2017) is in the tradition of the big dumb object story, or, in this case, the maybe not quite so big as something the apparent size of the moon but only detectable in the visible range of the electromagnetic spectrum suddenly appears in the solar system. However it may be as small as a button but, more importantly, a precursor to alien invasion. The Murders of Molly Southborne4 by Tade Thompson (Tor.com publishing) is also an extract, two pages this time; too short an extract to appraise properly. In the non-fiction items the extract from Modern Masters of Science Fiction: Iain M Banksa by Paul Kincaid is mainly about Feersum Endjinn, Whit, A Song of Stone and Excession. Juliet E McKenna’s The Myth of Meritocracy and the Reality of the Leaky Pipe and other Obstacles in Science Fiction and Fantasyb examines the ways in which women are undervalued in and marginalised from SF. There is an extract from Wells at the World’s Endb by Adam Roberts in which he looks at The Invisible Man. Various contributors consider The 2017 Shadow Clarke Awardsc. The Unthinkability of Climate Change: Thoughts on Amitav Ghosh’s ‘The Great Derangement’d by Vandana Singh deals with the unwillingness of people to think about climate change. 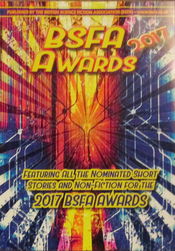 This year’s BSFA Awards (for works published last year) were announced at Eastercon on Saturday 31st March. The BSFA’s annual booklet containing the nominees for the various awards for 2017 publications arrived on Thursday morning 29th Mar. The deadline for postal votes is (was!) Mon 26th Mar and for electronic submissions Wed 28th Mar. The results will be announced on Saturday 31st Mar. Not the BSFA’s fault it arrived late. Easter is about as early as it can be this year and there was precious little time between the close of the submission phase for the final nominations and Easter. They’ve done well to get it out at all. Just as well I’m going to Eastercon this year where I can vote in person. I’ve got my work cut out to read it all before then though. My (belated) thoughts on its contents will appear next week.